Hello my friend, and welcome to the Paper Craft Crew Colour Challenge! This week, the design and layout of your project is your choice. All you need to do is include 3 of the 4 colours shown in the challenge. Neutrals are allowed as ‘freebies’, such as white, black, gray or brown. How are these for some tropical, summer themed colours?! I’m sure you’ll have fun with this challenge. Here’s what I decided to do with my card. I wasn’t sure how I was going to work in the colours without forcing you to put on sunglasses to view my card! Finally, I decided to create my own background, or DSP look, using the Colorful Seasons stamp set. You may recognize the layout – a few weeks ago I participated in the Craft Project Central sketch challenge, and this was the sketch layout. You can see my card for that challenge in THIS POST. The three colours I chose to use are Lemon Lime Twist (lime), Tempting Turquoise (turquoise) and Tranquil Tide (teal). I started with a card base of Lemon Lime Twist cardstock, and added a panel of Tranquil Tide cardstock. The Whisper White cardstock is cut into 4 pieces; on the left side they are 1 1/4″ x 1 1/4″, and 1 1/4″ x 3 1/2″. On the right side, they measure 2 1/4″ x 3 1/2″ and 2 1/4″ x 1 1/4″. 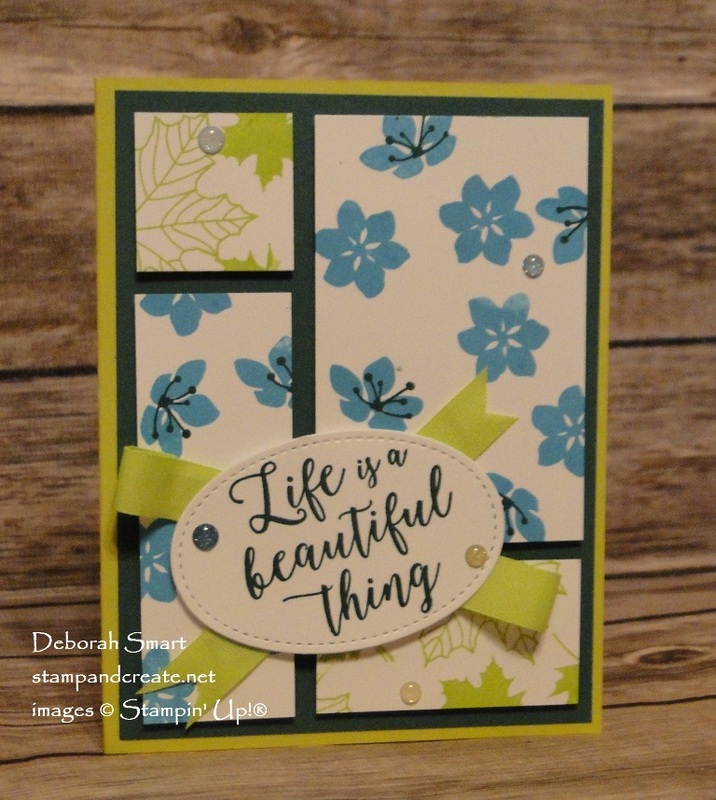 The 2 larger panels are randomly stamped with two of the flowers from the Colorful Seasons stamp set in Tempting Turquoise. The middle stamens in the flowers are stamped in Tranquil Tide. For the 2 smaller panels, I stamped the 2 different leaves in Lemon Lime Twist ink. Each panel was then attached to the Tranquil Tide panel using Stampin’ Dimensionals. For the sentiment, I used Tranquil Tide ink onto Whisper White. Then it was die cut using my Big Shot and Stitched Shapes Framelits Dies. I layered some lengths of the new 1/2″ Finely Woven Ribbon in Lemon Lime Twist under the sentiment, then added some Glitter Enamel Dots to finish off the card. I hope you’ll feel inspired to come join our Paper Craft Crew colour challenge now! Check out what the rest of the Design Team have created, on the Paper Craft Crew challenge page, then grab the link and join us! To order the supplies I used to create my card, click on the images below. You’ll be taken directly to my online store! Next Next post: Join the INKcredibly Creative Crew Today! Such a cute card. Very springy! I love those colors together. Thanks, Susan! I love these colours, too. I hope you’ll join in our challenge for this week! hi, Can anyone play along with the challenge? Pretty card!